GENUINE FAIR ISLE KNITWEAR DESIGNED AND HANDCRAFTED ON FAIR ISLE, SCOTLAND BY ELIZABETH RIDDIFORD. A genuine all-over patterned Fair Isle jumper is a true work of art, taking an average of over 100 hours to hand-knit, plus a certain amount of preparation time for garment design, including the intricate use and placement of the traditional patterns and colours. Hand-spun garments take even longer to produce - the hand-spinning process itself taking many hours to complete. 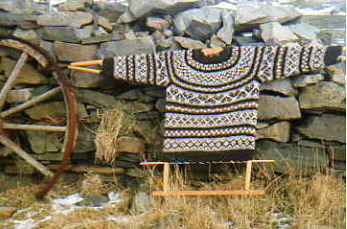 Traditional Fair Isle hand-knitted garments are highly labour-intensive and are therefore very costly to the customer. Nowadays, modern hand-frames help to speed up the process, thus enabling the traditional craft and skills of Fair Isle knitting to continue on the Isle in a manner which is economically viable for both knitter and customer alike. Elizabeth likes to work with the beautiful natural undyed colours of wool as they come from the locally grown Fair Isle and Shetland sheep – Shetland black, moorit (brown), fawns (eesit, mooskit, moggit), greys (shaela, sholmit) and natural white, as well as the bold richness of the well-known traditional Fair Isle colours of madder (red), indigo blue, yellow, moorit and natural white. She also chooses to work with the traditional Fair Isle OXO patterns, as well as a variety of other traditional Fair Isle patterns which inspire and remind her of the everyday natural world of Fair Isle itself. "I have been a Fair Isle hand-knitter and hand-spinner since moving to Fair Isle in 1981, having learnt the intricate patterns and techniques of real Fair Isle knitting from experienced local Fair Islanders. These skilled and talented ladies included Annie Thomson, Edith and Aggie Stout, all born on Fair Isle in the early 1900s and who, along with their sisters and cousins, had been taught to hand-knit by their mothers and grandmothers at the tender age of 3 or 4 years old in order to help supplement their families’ income. The tradition of Fair Isle hand-knitting is still practised and passed on by mothers, grandmothers and great-grandmothers to their daughters on Fair Isle today, although nowadays this is mostly for the pleasure of knitting for family members and friends. Whilst enjoying the pleasure and challenges of learning Fair Isle hand-knitting during my early years on Fair Isle, I also fell in love with hand-spinning the beautifully soft pure Fair Isle fleeces which are grown on the island and have long been the proud owner of Spinning Wheel number 45 – a work of art in its own right, hand-crafted by Annie’s husband Stewart Thomson. For several years in the 1980s and 1990s, I was kept busy giving hand-spinning and natural dyeing tuition to interested visitors to Fair Isle whilst hand-knitting my homespun into much sought-after all-over hand-spun, hand-knitted Fair Isle jumpers. These days knitting and spinning courses for visitors to the Isle are provided by another gifted hand-spinner and hand-knitter, Kathy Coull of Upper Leogh. " Between 1989 and 2011, Elizabeth was also an active long-term member of Fair Isle Crafts Ltd - a small, workers’ co-operative which was established on the island in 1981 - designing and producing hand-frame knitted and hand-finished garments of recognised highest quality which were sold direct to visitors to Fair Isle from all over the world. Elizabeth continues to be happily self-employed - producing her own personally hand-frame knitted and hand-finished 'Exclusively Fair Isle' hats and accessories at her crofthouse home on Fair Isle. Elizabeth's knitwear is available for sale on Fair Isle and here via her website, and is sold direct to individual customers from throughout the UK and around the World from as far as the USA and Canada to Australia. Whilst continuing to traditionally hand-knit garments for her family, hand-frame knitting and hand-finishing continue to be her preferred method of small-scale commercial production for her business. This allows her the enjoyment and creative satisfaction of hand-crafting in a way which continues to involve her skills and input as a traditional Fair Isle knitter and designer, but which is less time and labour intensive than traditional Fair Isle hand-knitting and thus more cost effective for herself and her customers. The personal, hand-crafted nature of Elizabeth's knitwear is much appreciated by her customers, and at no stage does she use the aid of a computer, electric or electronic knitting machine or linking machine in the production of any of her work. Whilst faster, more industrial commercial machines and mass production methods such as those mentioned above are now available for knitters to use on mainland Shetland and elsewhere, Elizabeth has made the positive decision to continue personally hand-crafting all of her 'Exclusively Fair Isle' knitwear on the island of Fair Isle in the traditional cottage-industry way that she and her customers enjoy. Each of her 'Exclusively Fair Isle' hats and accessories is guaranteed designed and hand-crafted by Elizabeth at her crofthouse home on Fair Isle, and all of her garments carries Elizabeth's own distinctive label with proof of authenticity and place of origin. 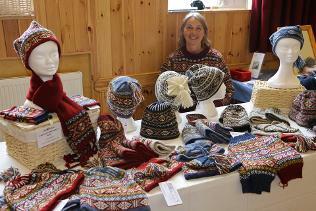 Elizabeth Riddiford with her display of traditional 'Exclusively Fair Isle' hats and accessories during a Cruise Ship visit to Far Isle in late May, 2015. I would like to take this opportunity to once again thank all my customers for your continuing interest and support for my knitwear, it is very much appreciated. filmed during Fair Isle Tall Ships Event, July 2011.
and again in the same series beginning on 20th October, 2015 on BBC2 . 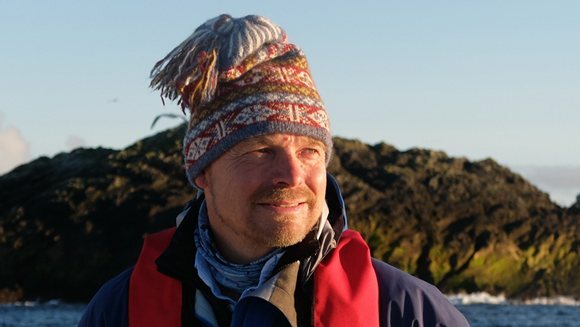 Paul also wore the same hat during more than one programme featuring the North Isles of Shetland in a new series of 'Grand Tours of the Scottish Isles', screened by BBC2 from 12th, October, 2015. BBC1 Scotland's 2 part documentary ' Fair Isle - Living on the Edge', first screened on 28th November and 5th December 2016. Unless stated, all text and photographs on this website are Copyright of Elizabeth Riddiford, 2012. All rights reserved. All knitwear designs on this website are the Intellectual Copyright of Elizabeth Riddiford, Fair Isle. All rights reserved.